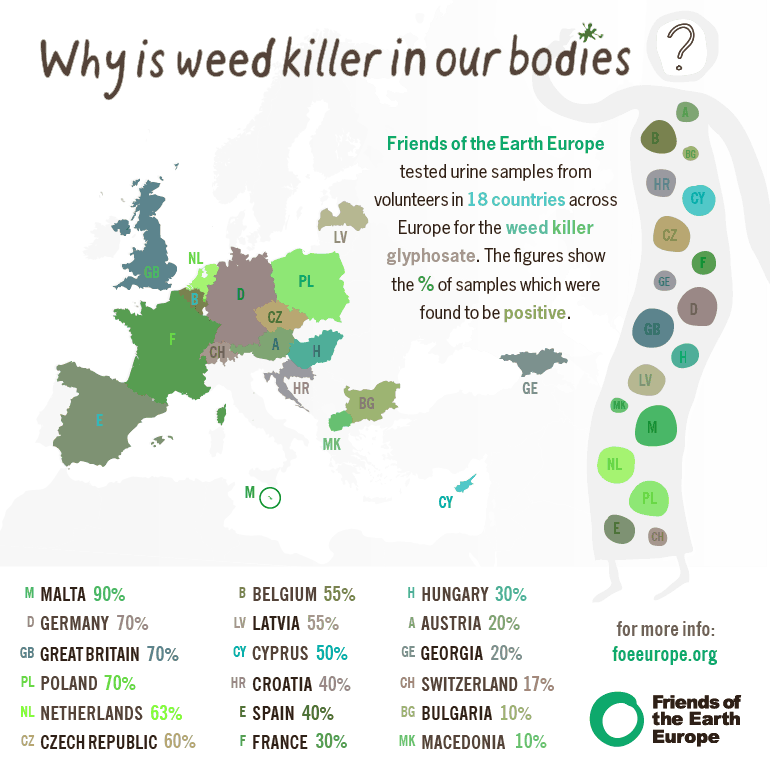 People in 18 countries across Europe have been found to have traces of the weed killer glyphosate in their urine, show the results of tests commissioned by Friends of the Earth Europe and released today . The findings raise concerns about increasing levels of exposure to glyphosate-based weed killers, commonly used by farmers, public authorities and gardeners across Europe. The use of glyphosate is predicted to rise further if more genetically modified (GM) crops are grown in Europe . Despite its widespread use, there is currently little monitoring of glyphosate in food, water or the wider environment. This is the first time monitoring has been carried out across Europe for the presence of the weed killer in human bodies. Friends of the Earth Europe is calling on the European Union to urgently investigate how glyphosate is finding its way into people’s bodies; to increase the levels of monitoring in the environment and in food and water; and to introduce immediate restrictions on the use of glyphosate. Friends of the Earth Europe commissioned laboratory tests on urine samples from volunteers in 18 countries across Europe and found that on average 44% of samples contained glyphosate. The proportion of positive samples varied between countries, with Malta, Germany, the UK and Poland having the most positive tests, and lower levels detected in Macedonia and Switzerland. 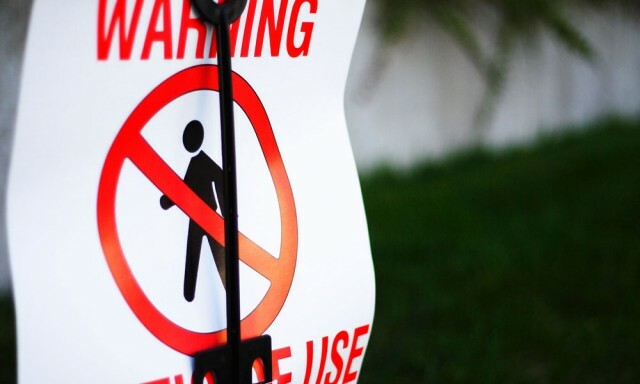 All the volunteers who provided samples live in cities, and none had handled or used glyphosate products in the run-up to the tests which were carried out between March and May 2013. Glyphosate is used on many genetically modified crops. 14 new GM crops designed to be cultivated with glyphosate are currently waiting for approval to be grown in Europe. Approval of these crops would inevitably lead to a further increase of glyphosate spraying in the EU. The biggest producer of glyphosate is Monsanto which sells it under the brand name ‘Roundup’. Two weeks ago the US Department of Agriculture announced that it had found GM wheat developed by Monsanto that has not been approved anywhere in the world growing in a field in Oregon, leading to some countries restricting or testing US wheat imports and farmers in the US starting legal cases against the company. Urine samples were collected from volunteers in Austria, Belgium, Bulgaria, Croatia, Cyprus, Czech Republic, France, Georgia, Germany, Hungary, Latvia, Macedonia, Malta, Poland, Spain, Switzerland, The Netherlands, and the UK. A total of 80/182 samples tested were found to contain glyphosate. Volunteers were all city-dwellers and included vegetarian and non-vegetarian diets. No two samples were tested from the same household. The samples were analysed by Dr Hoppe at Medical Laboratory Bremen in Germany. The full results of ‘Determination of Glyphosate residues in human urine samples from 18 European countries’ by Medical Laboratory Bremen are available online.